Australia has welcomed French President Emmanuel Macron on his first official visit, focused on defense links and climate change. 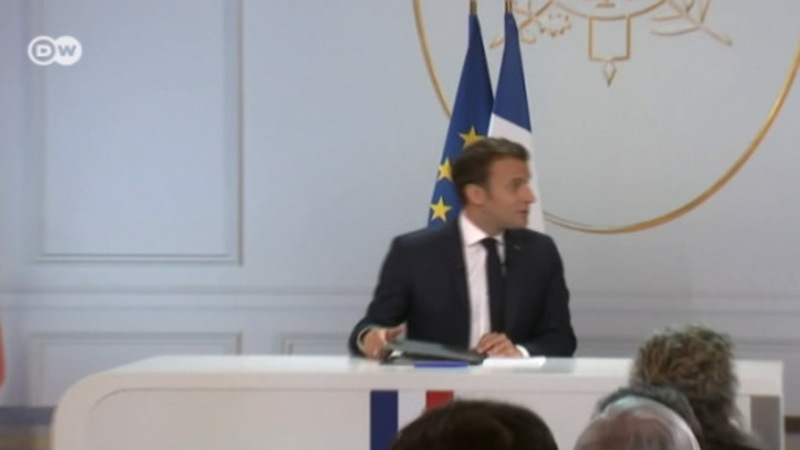 Macron will later head to New Caledonia, one of France's territories in the South Pacific. Australian Prime Minister Malcolm Turnbull welcomed French President Emmanuel Macron Tuesday in Sydney, emphasizing the nations' shared sacrifices in trench warfare against Imperial Germany during World War I.
Turnbull had been in France last week for commemorations. Macron arrived fresh from a high-profile visit to Washington, prior to a matching US visit by German Chancellor Angela Merkel. Traveling with French military and naval contractors, Macron said on arrival in Sydney that France — a UN Security Council veto power — wanted to be an "even stronger partner" under a deal to build and maintain a new fleet of diesel-electric submarines for Australia's navy. The first Barracuda-class submarine is due to be launched in 2027. In 2016, Turnbull's government handed France's majority state-owned Naval Group (formerly DCNS) a €31 billion deal to build 12 submarines in Australia's southern port city of Adelaide. To win the contract, Naval beat competing submarine supply bids from Germany and Japan. Macron's office added that France considered Australia a key partner in ensuring maritime security in the Indian and Pacific oceans, given China's expanding power. During his three-day visit, Macron will also focus on climate change and its impacts on coral reefs — exemplified by die-off along Australia's Great Barrier Reef — and Pacific island states, such as Tuvalu, that face sea-level rises. New Caledonia and French Polynesia, including Tahiti, are two prominent French overseas territories in the vast South Pacific, where France has some 8,000 military personnel based. In 1998, New Caledonia's indigenous communities and Paris entered into a special power-sharing arrangement spanning a 20-year time frame. Mururoa, an atoll 1,250 kilometers (780 miles) southeast of Tahiti, was where France conducted extensive nuclear testing from 1966 until 1996. Its testing was strongly opposed by environmental groups, notably Greenpeace, and New Zealand, which in the 1980s declared its waters nuclear-free, falling offside with its long-time ally the United States. In 1986, 13 nations, including Australia, New Zealand and a swath of Pacific island states, adopted the South Pacific Nuclear-Free Zone Treaty. RNZ: "50 years after Mururoa"
There's just a month to go till the EU heads to the polls. So what's on the German agenda? And do Germans even care? DW Stammtisch hosts Damien McGuinness and Michaela Küfner hit the campaign trail with The Economist's Tom Nuttall and journalist Emmanuelle Chaze. Plus, we unearth Germany's mysterious love for "Spargelzeit."